In addition to rescuing horses, we do so much more! Lessons are also provided to able-bodied riders during the summer months. Lessons are private and given by certified instructors. Volunteers help with keeping stalls clean, grooming horses, exercising horses, helping with veterinarian and farrier care and basic horse training. Fundraising activities are organized and held at the Rescue. They also help with potential adoptions for the horses, but the adoptions fall under strict guidelines. For further information on adoptions, please contact the Rescue. The Rescue is available for private boarding and is listed as an emergency evacuation site for horses for both Grand and Summit Counties. For further information on horse boarding and emergency evacuation plans, please contact the Rescue. 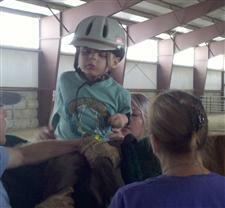 The Troublesome Horse Rescue's indoor arena is open to the public year round for horse exercising and small events. We have an indoor 120 X 200 foot arena which is open to the public and for private use as well. Private horse exercises can be arranged throughout the year with a minimal charge of $10.00 per horse for the day. 4-H Clubs are also welcome to use the arena for their weekly events/meetings and there is no charge for 4-H Clubs. Fundraisers, weddings and dances are also welcome at the arena. Our Rescue is an emergency evacuation location for area fires in both Summit and Grand Counties. For further event information for our arena use, please contact the Rescue.